The compressed time schedule for these ambitious revamp projects required use of the main automation contractor (MAC) approach to enable much of the work to be performed in parallel and reduce the number of supplier interfaces. In 2011, Pandora Methanol acquired petrochemical production facilities in Beaumont, Texas that had been mothballed since 2004. These two plants, a 13-year old ammonia plant and a 50-year old methanol plant, had received only marginal maintenance during this extended shutdown and had suffered direct hits from two major hurricanes. Not surprisingly, the process units, plant piping, instrumentation, and associated infrastructure had all experienced significant deterioration. The existing plants were equipped with a variety of outdated instrumentation and controls. This included extensive pneumatic instrumentation in both plants, plus a large number of standalone electronic controllers, chart recorders, some hard-wired interlocks, and older valves from several different suppliers, plus two outdated PLCs provided by the compressor supplier. Following the acquisition, the facility's new owners established the ambitious goal of completing both the process and I&C revamps for both plants in just eight months, with additional plans to increase capacity. According to Olaf Wagner from Wagner Instrumentation Consulting Services, a consultant to the facility's owners, "This compressed time schedule required use of the main automation contractor (MAC) approach to enable much of the work to be performed in parallel and reduce the number of supplier interfaces." In 2011, OCI Nitrogen (The Netherlands), a wholly owned subsidiary of Cairo, Egypt-based Orascom Construction Industries (OCI), acquired this integrated ammonia-methanol production facility located in Beaumont, Texas. OCI acquired the plant through a joint venture with Janus Methanol AG (now Gigas Methanol), named Pandora Methanol LLC. OCI initially held a 51 percent stake in the joint venture, but subsequently assumed full ownership. The facility includes an approximately 13-year old ammonia plant with a production capacity of 250,000 tons per year and an approximately 50-year old, 750,000 ton-per-year methanol plant; plus associated storage tanks and utilities. The facility has also pipeline connections to adjacent customers and port access on the Gulf Coast for import/export purposes. The integrated methanol-ammonia facility was started up in the late 1960s. The methanol unit was modernized in the early 1980s using Lurgi GmbH's Low Pressure Methanol technology and a new ammonia line was started up in 2000 based on the Haldor Topsoe technology. The last owner of the plant, the Eastman Chemical Company, took over the plant from Terra Industries in 2007 after it had been idle since 2004 due to high domestic prices for natural gas feedstocks. Following the acquisition, the joint venture made a plan to rehabilitate and update the integrated facility's operating systems and environmental controls, with ammonia production initially targeted to commence in the fourth quarter of 2011 and methanol production in 2012. According to Wagner, as an automation supplier, Yokogawa's offering spanned the vast majority of the project's requirements, including a well-proven integrated DCS/SIS solution in the company's CENTUM/ProSafe-RS platform. The fact that OCI had a previous positive experience restarting a plant in Indonesia using Yokogawa also entered into this decision to a certain degree. In a recent phone interview with ARC Advisory Group, Olaf Wagner commented that even though the methanol plant's process units had been updated in the 1980s, the engineers involved at the time continued to use a combination of standalone pneumatic and electronic loop controllers and chart recorders, rather than a unified distributed control system (DCS) of the type that came into widespread use in petrochemical plants such as this in that decade. Along similar lines, Wagner commented that, rather than a modern, triple-redundant critical control/ESD system, the two large Dresser Rand compressors in the ammonia plant were controlled by packaged PLCs with surge control performed by dedicated single-loop electronic controllers. With just eight months to complete the I&C replacement/upgrade project, Wagner started with what essentially was a clean sheet of paper. Realizing that the only way his organization could complete this ambitious project within this compressed time schedule was to engage the services of a main automation contractor to assume turnkey responsibility for supplying, configuring, and commissioning the field instrumentation, process control system, and critical control/safety system; including any third-party components. Once that decision to engage a MAC was made, Wagner reviewed proposals from three major global automation suppliers. He ultimately selected Yokogawa's local organization in Houston, Texas as the main automation contractor for the project. According to Wagner, "While all three proposals we received had a similar cost basis; in projects like these, cost is not a primary issue, because just three days delay in startup or one trip on a methanol plant once it's up and running can easily equal the cost of the entire automation investment." According to Wagner, as an automation supplier, Yokogawa's offering spanned the vast majority of the project's requirements. This included a well-proven integrated DCS/SIS solution in the company's CENTUM/ProSafe-RS platform and most of the field systems. The fact that OCI had a previous positive experience restarting a plant in Indonesia using Yokogawa also entered into this decision to a certain degree. For any MAC project to succeed, it's important for all parties to carefully define and agree upon the scope upfront. For this project, as the main automation contractor, Yokogawa assumed responsibility for supplying and configuring all field devices and field systems, including Yokogawa and third-party analytical systems (CEMS, mass spectrometers, and gas chromatographs) and all process control, rotating equipment control, and safety systems and associated networking, rack rooms, and the central control room. As MAC, Yokogawa was also responsible for configuring and implementing the controls design, plus associated check out, commissioning, system integration, and training services; and generating the necessary documentation. Wagner's small group, in turn, took responsibility for overall control and instrumentation design, supervising the installation sub-contractor, retrofitting the hundreds of valves and actuators installed throughout the two plants and designing the DCS faceplate displays, starting with Yokogawa "typicals" to save time. According to Wagner, while it ultimately took approximately 12 months to get both plants up and running again due to complications with the process piping; the I&C side of the project was largely completed on schedule in just eight months. 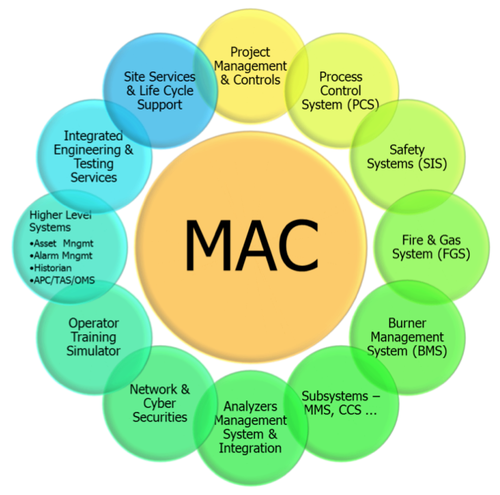 As mentioned previously, this was only possible because engaging with Yokogawa to assume MAC responsibilities enabled much work to proceed in parallel and reduced the number of supplier interfaces, which saves time, reduces potential opportunities for miscommunication, and reduces finger pointing when the inevitable problems arise. "Yokogawa got the DCS racks together in a surprisingly short time, which really helped us compress the overall schedule," according to Wagner. "Their group in Houston was very effective, reliable, competent, cooperative, and efficient...all important characteristics in a MAC." With today's abundance of low-cost natural gas feedstocks now available in North America, it appears that the new owners made an excellent decision (if one not entirely without risk) to invest in acquiring, refurbishing, and restarting this 50-year old production facility with new processing equipment and modern automation. It also appears that its decision to employ the MAC model for the project worked out well for all parties. For further information or to provide feedback on this article, please contact your account manager or the author at pmiller@arcweb.com. ARC Views are published and copyrighted by ARC Advisory Group. The information is proprietary to ARC and no part of it may be reproduced without prior permission from ARC.